At about 2 in the morning after finishing my work I locked the door of the room and lay in my bed. Within about 2 or 3 minutes I heard H.P.B.’s voice in her room calling me. I got up with a start and went in. She said “some persons want to see you” and after a moment added “Now go out, do not look at me.” Before however I had time to turn my face I saw her gradually disappear on the spot and from that very ground rose up the form of ∴  By the time I had turned back I saw two others dressed in what I afterwards learned to be Tibetan Clothes. One of them remained with ∴ in H.P.B.’s room. The other one I found seated on my bed by the time I came out. I saluted him & asked him if he had any orders to give. He said: “If there are any, they will be told to you, without being asked.” Then he told me to stand still for some time and began to look at me fixedly. I felt a very pleasant sensation as if I was getting out of my body. I cannot say now what time passed between that and what I am now going to relate. But I saw I was in a peculiar place. It was the upper end of Cashmere at the foot of the Himalayas. I saw I was taken to a place where there were only two houses just opposite to each other and no other sign of habitation. From one of these came out the person who had written to me the Hindi letter above referred to and who has been subsequently corresponding with me. I may mention to you his name since he has allowed it to be published in Mr. Sinnett’s book called The Occult World which has just come out. Mr. Sinnett has dedicated the book to this person “Koot Hoomi ∴” It was his house. Opposite him stops ∴ Brother K- ordered me to follow him. After going a short distance of about half a mile we came to a natural subterranean passage which is under the Himalayas. The path is very dangerous. There is a natural causeway on the River Indus which flows underneath in all its fury. Only one person can walk on it at a time and one false step seals the fate of the traveller. Besides this causeway there are several valleys to be crossed. After walking a considerable distance through this subterranean passage we came into an open plain in L—-k. There is a large massive building thousands of years old. In front of it is a huge Egyptian Tau. The building rests on 7 big pillars in the form of pyramids. The entrance gate has a large triangular arch. Inside are various apartments. The building is so large that I think it can easily contain twenty thousand people. I was shown some of these compartments. This is the Chief Central Place where all those of our Section  who are found deserving of Initiation into Mysteries have to go for their final ceremony and stay there the requisite period. I went up with my Guru to the Great Hall. The grandeur and serenity of the place is enough to strike anyone with awe. The beauty of the Altar which is in the centre and at which every candidate has to take his vows at the time of his Initiation is sure to dazzle the most brilliant eyes. The splendour of the CHIEF’s Throne is incomparable. Everything is on a geometrical principle & containing various symbols which are explained only to the Initiate. But I cannot say more now as I come now under an obligation of Secrecy which K- took from me there. “Cashmere” is Kashmir. It is well known amongst Theosophists that the Master K.H. is said to be a Kashmiri by birth. Kashmir is the northwestern region of the Indian subcontinent. Its upper end, as stated by Damodar, is “at the foot of the Himalayas” and approaches what is geographically classified as the Trans-Himalayan region. It was stated several times in private correspondence by H.P. Blavatsky that the Master M. and Master K.H. live very near to one another, in a remote yet tranquil location. She herself had lived in the home of the Master K.H. for some time in the 1860s during the preparation and training for her public mission. In an October 1881 letter to Mrs Hollis Billings, HPB wrote, “Now Morya lives generally with Koot-Hoomi who has his house in the direction of the Kara Korum Mountains, beyond Ladak, which is in Little Tibet and belongs now to Kashmire. It is a large wooden building in the Chinese fashion pagoda-like, between a lake and a beautiful mountain. … They come out very rarely. But they can project their astral forms anywhere.” Geographical details such as these can be found confirmed by the Masters themselves throughout Their Letters although it is made clear that these particular Masters sometimes travel to and reside temporarily in other locations, including Tibet proper. A seemingly related passage in the Introductory of “The Secret Doctrine” mentions “the solitary passes of Kuen-lun” (the footnote says “Karakorum mountains, Western Tibet”) and goes on to say that “Along the ridge of Altyn-Toga, whose soil no European foot has ever trodden so far, there exists a certain hamlet, lost in a deep gorge. It is a small cluster of houses, a hamlet rather than a monastery, with a poor-looking temple in it, with one old lama, a hermit, living near by to watch it. Pilgrims say that the subterranean galleries and halls under it contain a collection of books, the number of which, according to the accounts given, is too large to find room even in the British Museum.” The picture below is said to have been painted by an individual known as Juala Kula or Djwhal Khul, a disciple of the Master K.H., to represent this area where the Masters have their homes. 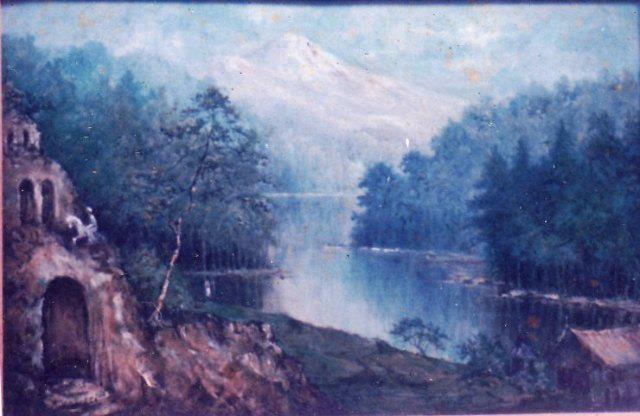 The painting has been given the title of “A Ravine in Tibet” although technically it is not in Tibet but in the area that was once known as Little Tibet. “All those of our Section” may refer either to the “Second Section” of the Theosophical Movement – the First Section being comprised of the Masters and Adepts themselves, the Second Section of chelas and lay chelas (disciples and lay disciples), and the Third Section of all other members and associates of the Movement at large – or of that “section” of the entire Great Brotherhood which has come to be referred to by Theosophists as the Trans-Himalayan Brotherhood. “I was taken in some mysterious way in my astral body to the real place of Initiation where I shall be in my body for the Ceremony if I show myself deserving of the blessing.” As the whole excerpt clearly shows, all of this exists on the physical plane and this sentence in particular reveals that the actual initiation ceremony undergone by a chela is in his or her physical body and in this particular physical plane location in the Trans-Himalayan region. There is obviously some specific and important reason why it all exists in the realm of physical and material objectivity rather than solely on some subtle or astral plane. The Masters themselves are incarnated in physical bodies and live right here on the physical plane, even though their most important work is performed on higher planes. The Masters’ letters refer to them having to eat, sleep, dress, read, etc. just as we also do. The idea of them being “Ascended Masters” does not originate with Theosophy and this concept and term was not invented until the 1930s. As for Damodar, he did indeed “show himself deserving of the blessing” and four years later, in 1885, his Master called for him. Following the careful preparations and plans laid out for his journey by the Master K.H., he made his way to the Himalayas and although HPB and a few others heard from him after that time, he never returned to India but remained with the Masters. 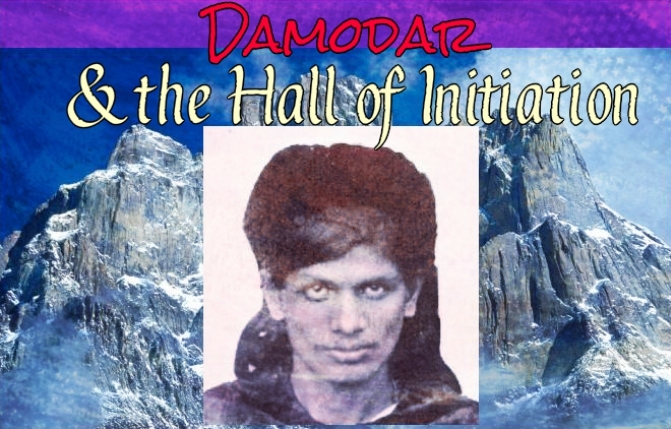 All of this, Damodar’s words to Mr Judge included, “ought to be a warning” too that the matter of initiation is not something to be talked about lightly or glibly. It is infinitely more sacred, important, powerful, difficult, challenging, and serious than any of the thousands of pseudo-Theosophists and New Agers who today claim to be initiates or experts on the subject can even begin to imagine. “Conscious as well as unconscious deception” abounds in spiritual and religious circles and we must deliberately endeavour and take efforts every day to rid ourselves of every last trace of it before we can start to think about the long, arduous, dangerous, and sometimes even deadly, trek up the mount of initiation. SOME RELATED ARTICLES: The Masters and Madame Blavatsky, Maji – The Yogini of Benares, Salvation from Christianity (by Damodar), Words from The Masters about H.P. Blavatsky, Who are you, Madame Blavatsky?, Who was William Quan Judge?, The Final Mahatma Letter, The Closing Cycle, The Letter from the Maha Chohan, What is a Chohan?, The Masters in Theosophy, Gandhi on Blavatsky and Theosophy, 12 Things Theosophy Teaches, Belief in God is Superstition, The Danger and Deception of Channelling, 14 Good Reasons to reject the Alice Bailey Teachings, Theosophy and Agni Yoga, The Unavoidable Facts about C.W. Leadbeater, Maitreya in the Light of Real Theosophy, and The Question of Orthodoxy, Dogmatism, or Fundamentalism.